Glycosylation is one of the most common post-translational modifications of proteins, as shown in Figure 1. N-linked glycosylation occurs when glycans are attached to asparagine residues on the core protein. O-linked glycosylation occurs when glycans are attached to serine or threonine residues. Both chemical and enzymatic methods exist for removing oligosaccharides from glycoproteins. However, chemical methods such as β-elimination with mild alkali or mild hydrazinolysis can be harsh and may result in incomplete sugar removal and degradation of the protein; whereas, enzymatic methods are much gentler and can provide complete sugar removal with no protein degradation. PNGase F is the most effective enzymatic method for removing almost all N-linked oligosaccharides from glycoproteins. PNGase F digestion deaminates the aspargine residue to aspartic acid, and leaves the oligosaccharide intact, keeping it suitable for further analysis. Oligosaccharides containing a fucose α(1-3)-linked to the glycan core are, however, resistant to PNGase F which can occur on some plant and insect glycoproteins. To remove O-linked glycans, monosaccharides must be removed by a series of exoglycosidases until only the Galβ1-3GalNAc (core 1) and/or the GlcNAcβ1-3GalNAc (core 3) cores remain attached to the serine or threonine. NEB’s O-Glycosidase, cloned from Enterococcus faecalis, can then remove these core structures with no modification of the serine or threonine residues. Any modification of the core structures, including sialyation, will block the action of the O-Glycosidase. Sialic acid residues are easily removed by a general α2-3,6,8,9 Neuraminidase A. In addition, exoglycosidases such as β(1-4)Galactosidase S and β-N-Acetylhexosaminidasef can be included in deglycosylation reactions to remove other complex modifications often known to be present on the core structures. This combination of enzymes may not remove all O-linked oligosaccharides but should remove many common oligosaccharide structures. The Protein Deglycosylation Mix II contains all of the enzymes, reagents, and controls needed to remove all N-linked and simple O-linked glycans as well as some complex O-linked glycans. This mix contains enzyme sufficient for 20 reactions or the cleavage of as much as 2 mg of glycoprotein. All of the enzymes and reagents included in the Protein Deglycosyation Mix II are Mass Spectrometry compatible. Following the deglycosylation reaction, samples are ready to be prepared for mass spectrometry analysis. 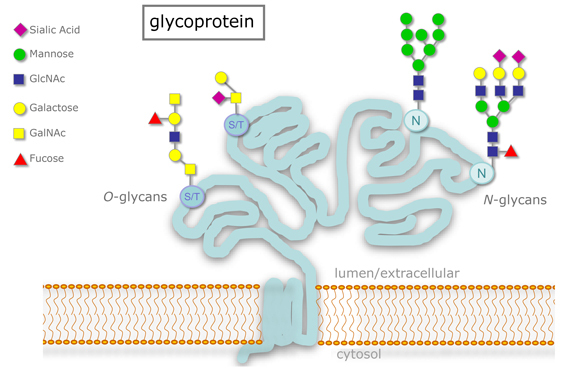 Figure 1: A Glycoprotein modified with O-linked and N-linked glycosylation. Enzymatic Deglycosylation of Bovine Fetuin under both native (10X Deglycosylation Mix Buffer 1) and reducing (10X Deglycosylation Mix Buffer 2) conditions. 20 µg reactions were loaded onto a 10-20% Tris-glycine SDS-PAGE gel. Lane 5: 5 µl Protein Deglycosylation Mix II. O-Glycosidase (NEB #P0733), also known as Endo-α-N-Acetylgalactosaminidase, is a recombinant enzyme cloned from Enterococcus faecalis (1). It catalyzes the removal of core 1 and core 3 O-linked disaccharides from glycoproteins. The molecular weight is approximately 147 kDa. PNGase F (Glycerol-free), Recombinant (NEB #P0709), also known as Peptide: N-glycosidase F, is cloned from Elizabethkingia miricola (formerly Flavobacterium meningosepticum) and expressed in E. coli (2). 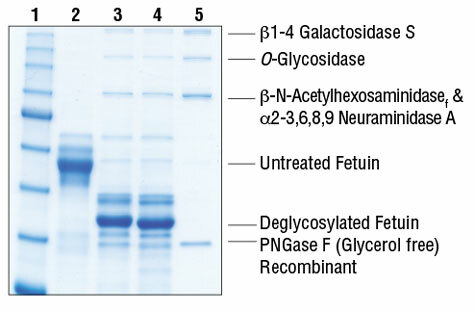 PNGase F (Glycerol-free), Recombinant is an amidase which cleaves between the innermost GlcNAc and asparagine residues of high mannose, hybrid, and complex oligosaccharides from N-linked glycoproteins unless α(1-3) core fucosylated. The molecular weight is approximately 36 kDa. α2-3,6,8,9 Neuraminidase A (NEB #P0722), also known as Sialidase A, is a recombinant enzyme cloned from Arthrobacter ureafaciens and expressed in E. coli (3). It catalyzes the hydrolysis of α2,3, α2,6, α2,8 and α2,9 linked N-acetylneuraminic acid residues from glycoproteins and oligosaccharides. The molecular weight is approximately 100 kDa. β1-4 Galactosidase S (NEB #P0745), is a recombinant enzyme cloned from Streptococcus pneumoniae and expressed in E. coli (4). It is a highly specific exoglycosidase that catalyzes the hydrolysis of β1-4 linked galactose residues from oligosaccharides. The molecular weight is approximately 231 kDa. β-N-Acetylhexosaminidasef (NEB# P0721), is a recombinant enzyme cloned from Streptomyces plicatus (5) and overexpressed in E. coli (6). It catalyzes the hydrolysis of terminal β-N-acetylgalactosamine and glucosamine residues from oligosaccharides. The molecular weight is approximately 100 kDa. The Protein Deglycosylation Mix II contains all of the enzymes, reagents, and controls needed to remove all N-linked and simple O-linked glycans as well as some complex O-linked glycans. This mix contains enzyme sufficient for 20 reactions or the cleavage of as much as 2 mg of glycoprotein. All of the enzymes and reagents included in the Protein Deglycosyation Mix II are Mass Spectrometry compatible. The Protein Deglycosylation Mix II is supplied with two different reaction buffers. Please reference the “Protocols and Manuals” tab for the specific protocol associated with each buffer system. The 10X Deglycosylation Mix Buffer 1 (NEB #B6044) should be used when native (non-denaturing) conditions are necessary. The 10X Deglycosylation Mix Buffer 2 (NEB #B6045) will reduce the glycoprotein, but will also provide the most efficient and complete level of deglycosylation. If non-denaturing conditions are not required, we recommend using 10X Deglycosylation Mix Buffer 2. Storage: It is recommended to store this kit at 4°C. All components of the kit will be stable for at least one year if stored correctly. The Protein Deglycosylation Mix II is not recommended for use on Mucin-like substrates. Koutsioulis, D. Landry, D. and Guthrie, E.P. (2008). Glycobiology. 18, 799-805. Robbins, P. et al. (1992). Gene. 111, 69-76. What is the difference between the discontinued Protein Deglycosylation Mix (NEB# P6039) and the new Protein Deglycosylation Mix II (NEB# P6044)? Two different reaction buffers (10X Deglycosylation Mix Buffer 1 and 2) are supplied with the Protein Deglycosylation Mix II. How do I know which buffer to use? Are downstream analysis such as HPLC and Mass Spectrometry compatible with the Protein Deglycosylation Mix II? I tried the Protein Deglycosylation Mix II on my glycoprotein and didn't see removal of the carbohydrate. What could be the problem? How much Protein Deglycosylation Mix II should I use to remove the carbohydrates under native (non-denaturing) conditions? What is a good control substrate for the Protein Deglycosylation Mix II? Are Protease Inhibitors acceptable for use with the Protein Deglycosylation Mix II reaction?